As a small nonprofit organization providing literacy services to adults, Learning Is For Tomorrow depends on contributions from supporters like you! Support LIFT when shopping on AmazonSmile! Select Learning Is For Tomorrow when you choose your charity. Thank you! LIFT now has a newsletter. Please sign up below to get updates from us. Thanks! 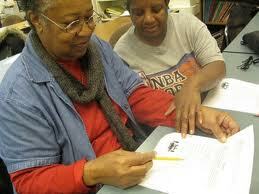 Learning Is For Tomorrow is a 501(c)3 nonprofit adult literacy organization. We are dedicated to providing quality literacy instruction and life-skills training to adult learners and assisting these individuals in becoming self-reliant life-long learners. We provide a learning environment which is supportive and incorporates best instructional practices. to contact us by phone or email. If you are Deaf or Hard-of-Hearing, email liftdeafclass@gmail.com. To reach a member of our staff, please use the contact information on the sidebar to the right. Please direct all other email inquiries to info@liftbaltimore.org.